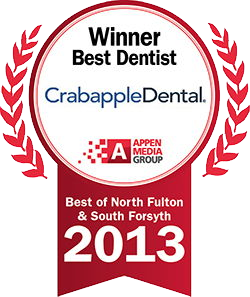 At Crabapple Dental, we always pursue ways to make dental care services more comfortable for our patients. In many cases, this involves investing in the latest dental technology, techniques or products. We realize that many patients avoid or put off needed dental procedures due to the dread or fear of the anesthesia injection. Therefore, we are proud to offer a revolutionary needle-free injection method using Kovanaze Nasal Spray. Today’s advancements in modern dentistry allow dentists to numb the maxillary arch of teeth without putting patients through the pain and anxiety of a dental shot. Effective Nose Spray for Numbing Teeth – No Shots! Kovanaze Nasal Spray, composed of tetracaine HCl and oxymetazoline HCl, represents the first FDA-approved, needle-free, regional dental anesthesia. 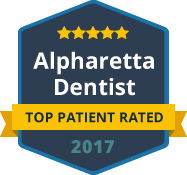 It is specifically designed to numb the teeth in the “smile zone,” or the upper teeth ranging from #4 to #13 in adults. The nose spray can also be used in children who weigh more than 88 lbs. The anesthesia delivery of Kovanaze is not only more comfortable for the patient, but it has shown a high efficacy rate of up to 96% as well. The process is simple. When you come in for your restorative procedure, your dentist will use a pre-filled sprayer to administer 2 sprays of the solution into your nasal cavity. In just ten minutes, your maxillary teeth should be numb and the procedure can begin. This dental injection alternative helps countless patients endure root canals, fillings, extractions and other procedures that are necessary to their oral health. In addition, you will likely not experience the same uncomfortable sensations of numbness or tingling in your lips and cheeks that are commonly associated with injectable anesthetics. Do you fear the dental shot more than the procedure itself? You may be a candidate for needle-free anesthesia. For more information about Kovanaze Nasal Spray with Dr. Sarah Roberts in Alpharetta, please contact us today. It is our privilege to deliver the latest that modern dentistry has to offer, so that you can enjoy the comfortable and pleasant experience you deserve in dental care.